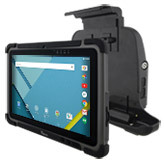 Winmate has updated its rugged Android 10.1-inch tablet designed to operate in extreme conditions. The new model M101M8 is getting faster CPU featuring the ARM Cortex A53 Octa Core processor, 2GB of system memory, Android 5.1 operating system, and other improvements. 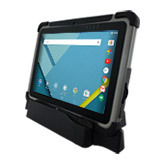 Winmate launched its original rugged Android tablet model M101M4 back in 2015. The unit was based on ARM Cortex A7 processor sealed in polycarbonate case with corner protection and protective I/O cover to work in harsh environments.The new M101M8 inherits virtually everything from the predecessor, but swaps internal hardware, changes the software and adds a couple of other things. The Winmate M101M8 tablet comes in the MIL-STD-810G-certified enclosure made to withstand operating drops, vibration, functional shock and all other kinds of physical impact. Environmental specs include a wide 14 to 122 degree Fahrenheit operating temperature range (and -4 to 140 degree when plugged in), four foot drop, and IP65 sealing rating, which means users won't have to shy away from rain. In short, the M101M8 can work safely almost in any circumstances. With wide range of accessories available for order the M101M8 can work anywhere from a field service to warehouse or it can be mounted in the vehicle for trucking and logistics applications. * Measured at dimming LCD brightness. Varies depending on the usage conditions, or when an external device is attached.